Are your ecommerce landing pages suffering from poor conversion rate because people aren’t engaging? First impressions are everything, and more so online, so your task is to figure out which on-site improvements will help you towards your goals. Once you start optimising, it’s a continuous process of reviewing, changing, testing and refining – aiming to find out what is most appealing to your customers, what they like and care about, what makes them trust you, what encourages them to purchase. There is always room for refinements so here are some tips on what you should consider when reviewing your pages. Before starting testing and implementing the changes on your landing pages, you have to be clear about what you want to accomplish. Whilst the end goal for an online store is to increase sales, at times you might also want to get more sign ups, or improve views of or engagement with product pages. Think about what success will look like as that will help with planning your optimisation tests. If you are clear about what you are trying to achieve, it will be easier to set measurable targets. Are you looking to increase your sales by 10% or pageviews of products by 15%? Or maybe you want your potential customers to browse further and spend more time reading content? Further engagement can also be demonstrated by the site visitor scrolling down the page if you have long product or category pages. In which case you’ll want to track how far down the page they get to. I believe in keeping reporting straightforward so when testing focus on tracking important metrics only. Ideally just one if you can, or a few if you have to, but that will help focus on measuring what is most important for your business at the time. Assuming you are using Google Analytics, like most of people looking after digital performance, set up goals to monitor how customers are converting. Our web-based software also makes it easy to keep track of on-site changes are by reporting on changes in trends, goals, pages. User-focussed content is more effective at engaging your customers and improving your conversion rates. So you should write up your customer personas to be clear about who you are targeting with landing pages. This also applies to general look and feel of your ecommerce site. Most importantly, include with personas what problems your customers are trying to solve or what they are trying to achieve. Once your team knows who your ideal or typical customers are, then it will be easier to focus on creating more relevant and engaging content on those pages. Value proposition explains why you’re better than or different from your competitors, and what you can deliver that they can’t. When writing it up, focus on benefits not features. It’s not always about the product looking top notch (unless you’re the industry or company where that matters of course) so it is more about how you can alleviate their problem. Check out how to write your value proposition by following Geoffrey Moore’s model. Does your copy reflect your value proposition? Once you have your customer personas and value proposition, review existing content on the site against how you describe what your clients are looking for. Check if it fits with what they are looking for, explains how you can solve their problems or fulfill their desires. The copy on your site has to reflect how you can improve your potential customers lives through what you offer. A great copy informs, compels, captivates, reflects what people search for and promotes key benefits. Econsultancy have compiled a great set of advice from experts on writing copy for product pages. Also, check out Copyblogger Demian Farnworth’s articles for superb advice on writing copy. Have you found your winning call to action? This is very important – test your call to action until you find the best performing one. Your call to action is like a visual sign that guides the buyer towards a specific action you want them to complete. Different things work for different sites. Start off with trying simple changes like different text, colour, shape, size or placement of the button to figure out what is most effective for your page. If small changes aren’t helping, then try a more drastic change of the button or page. Do your pages load fast? This is pretty self-explanatory. Slow page loading speed might drive your potential customers away from your online shop, so you should regularly check whether they can view your products within 3 seconds (Source: Radware). If you’re using Google Analytics, you can use Site Speed reports to check how you’re performing and get advice on where to improve. If you don’t have Google Analytics, you can use their online tool PageSpeed Insights. 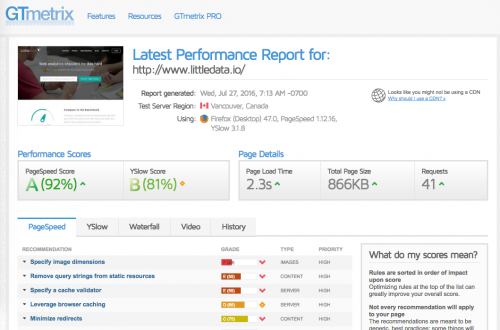 Other tool worth checking out is GTMetrix where you can grade your site’s speed performance and get a list of recommendations. 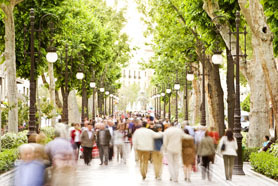 Do you need to optimise for mobile? It’s a very common fact that more and more people are using mobile devices to browse and buy online. But unless you have unlimited budget for ensuring that your ecommerce site is optimised for mobile, it is best to check in Google Analytics first whether you need to do it now. 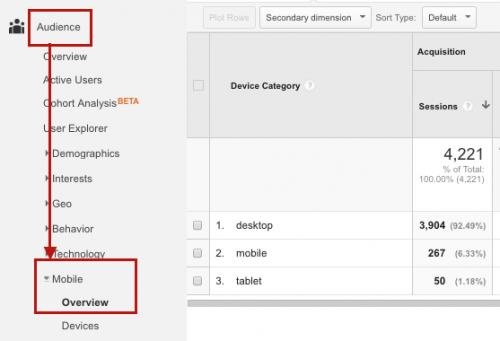 If you go to Google Analytics > Audience > Mobile > Overview report, you will get a breakdown of device categories that buyers are using to visit your online store. Here you can see that the majority of customers, almost 93% are using desktop so in this case (assuming you have a limited budget) you might want to make sure you have a responsive site at the very minimum, and leave a full optimisation for mobile device for later when there is a sufficient need. Now, if results were different and let’s say you had 60% of people visiting your site via mobile devices, then you would want to ensure that they’re getting the best experience on their device and don’t leave the site to buy from a competitor instead. Are your test results statistically significant? Evaluating your AB test results isn’t quite as simple as looking at the highest conversion rate for each test, which would be an incorrect way to interpret the outcome. You want to be confident that results are conclusive and changes you tested will indeed improve your conversion rates (or not, depending on the outcome of testing). That’s where statistical significance comes in. It gives you assurance about the results of your tests whilst taking into consideration your sample size and how confident you want to be about the importance of the results. By reaching over 95% statistical confidence in testing results, you can be sure that the winning variation performed better due to actually being an improved version, and not simply due to change. You can easily find a calculator online that tells you if your AB testing results were statistically significant and you should conclude the test or not – for example, try the calculator by Kissmetrics or Peakconversion. There is no one winning formula for how to make your pages more effective, but you have to be pro-active to figure out what they are – so keep testing until you do. Have any questions? Leave a comment below or get in touch with our experts!